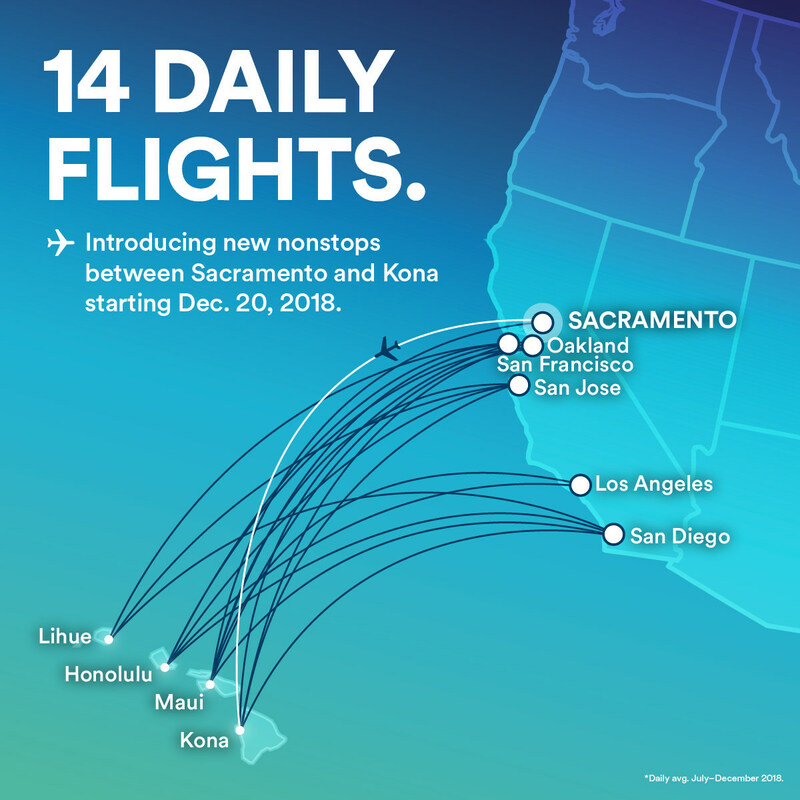 Alaska Airlines brings more aloha spirit to Northern California with the addition of new nonstop service between Sacramento, California, and Kona on Hawaii's Big Island. The new service, which is scheduled to begin Dec. 20, will be the only nonstop flight offered between the two destinations with a flight frequency of three times a week. Alaska currently offers nonstop service from Sacramento to Maui, Hawaii. Fly to Hawaii on Alaska Airlines from six California cities. "We know our customers love Hawaii, even in sunny California. 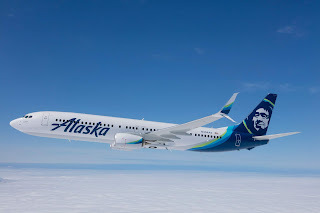 That's a big reason we're excited to add this new connection between Northern California and the Big Island," said John Kirby, vice president of capacity planning and alliances at Alaska Airlines. "This new route shows Alaska's ongoing commitment to continued growth and investment throughout the West coast." Please note: The flight schedule is adjusted two weeks after the initial start of service. Flight times based on local time zones. As Alaska continues to improve nonstop travel from key focus cities around California, the airline remains committed to low fares and excellent service for guests. Alaska is proud to have the lowest average fares and the most flights from the West Coast to Hawaii*. Alaska averages 29 daily departures to the Hawaiian Islands from 10 West Coast cities, which includes six California destinations: Los Angeles, Sacramento, San Diego, San Francisco, San Jose and Oakland. 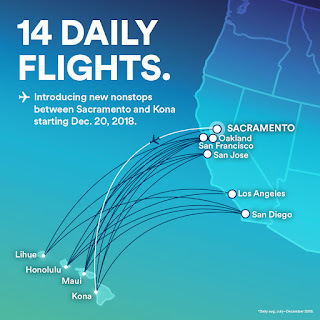 "We look forward to Alaska Airlines' new route from Sacramento to Ellison Onizuka Kona International Airport at Keahole launching this winter," said Island of Hawaii Visitors Bureau Executive Director Ross Birch. "This will give travellers an additional nonstop avenue between the island of Hawaii and the West Coast, and support continued demand from Northern California. With this service, visitors can easily experience our destination's rich culture and history, diverse climate zones, outdoor adventures and small town communities."